Around Nigeria: Update on NLC Protest in all states. As Expected, Members of The Nigerian Labor Congress have taken to the streets today, Wednesday, 18th may 2016 to protest the recent increase in price of fuel and other petroleum products. The Petrol pump price had been increased from N86 Naira to N145 which is over 50% and the Labor congress is asking the FG to either Increase its minimum wage or bring down the fuel price by reintroducing subsidy. 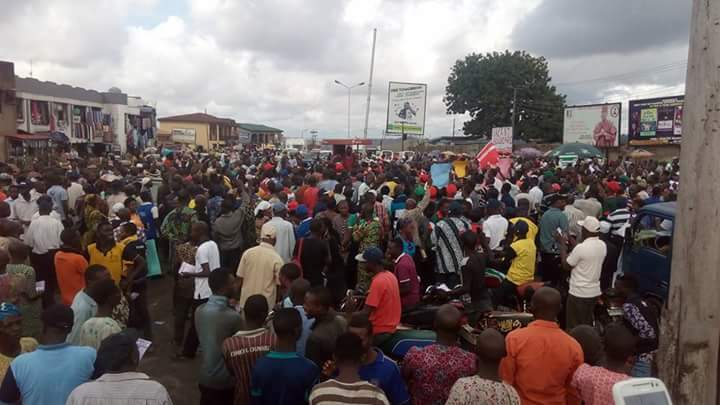 MyNaijaInfo (through our eye witness Reporters) have compiled pictures of protesters causing Gridlocks, sending school Children and Workers home and causing Grid Locks in the Following states: Lagos, Benin, Ibadan (Oyo state), Ogun, Delta (asaba), Osun and some other states. Keep checking this Link as Updates will be posted regularly. View Pictures of the Protest after the cut. . .
Keep Revisiting Mynaijainfo.com: More updates from other states shortly . . .
DO you think the NLC will win the FG by going on strike? Air your views, be heard!